The BGM-71 TOW missile is the main heavy anti-tank guided missile of the U.S. Army and U.S. Marine Corps, and is used in vehicle and helicopter installations. It was produced in very large numbers, and is in wide use in many countries. In late 1961, the U.S. Army initiated studies for a possible replacement for the French SS.10 (MGM-21) and SS.11 (AGM-22) anti-tank missiles then in U.S. Army service. The studies called for a tube-launched, optically-tracked, and wire-guided missile (hence the acronym TOW), and design contracts were awarded to three companies. Hughes was eventually awarded the prime development contract for the BGM-71 missile, and from 1963 until 1968, TOW was developed in parallel for both ground- and air-launched applications. Missile rounds used in the development phase included the XMGM-71A (soon changed to XBGM-71A) prototype tactical round, the XBTM-71A unarmed training round, and the XBEM-71A, which was equipped with special telemetry electronics for test and evaluation purposes. In June 1968, the first full-scale production contract for the TOW was awarded to Hughes. 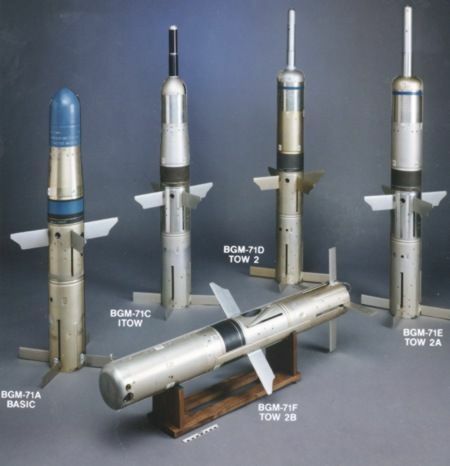 In 1970, the BGM-71A missile (and the BTM-71A training round) was first fielded by operational U.S. Army ground troops, replacing the MGM-32 Entac missile and the M140 106 mm recoilless rifle. In 1972, the TOW was deployed for combat use in South-East Asia. The TOW missile can be fired from tube launchers installed on vehicles, helicopters, or on a tripod on the ground. The BGM-71 is loaded into the launcher from behind, the missile container acting as a launch tube extension. As soon as the operator has identified a target using the launcher's telescopic sight, he can fire the missile. A very-short duration (0.05 s) rocket motor ejects the missile from the tube, and the mid-body stabilization fins and the control fins on the tail flip out. After a safe distance is reached, the solid-fuel main boost motor is ignited, and accelerates the missile to a speed of about Mach 0.9. The motor exhausts are on the side, because the tail is used to spool out the guidance wire. After launch, the operator simply has to keep the cross-hairs of his sight pointing at the target, and the guidance system will automatically transmit corrective commands to the system through the wire. The TOW is controlled in flight by its four gas-operated movable tail fins. The high-explosive shaped-charge warhead of the BGM-71A detonates on impact, and can penetrate armour with a thickness of about 600 mm. Minimum range for the TOW is about 65 m (70 yds), and maximum range is limited by the length of the guidance wire, which is 3000 m (3280 yds) for the BGM-71A. The development of the airborne TOW applications lagged slightly behind, after the XM26 armament subsystem (TOW on UH-1B helicopters) was terminated in 1968 in favour of a TOW/AH-56 Cheyenne combination. In March 1972, however, the Army began the development of an improved XM65 TOW/AH-1 Cobra armament subsystem, and later that year, the whole AH-56 program was cancelled. Also in 1972, the experimental XM26 was deployed to Vietnam as a short-term emergency measure. The helicopter-borne TOW systems use special stabilized sights to allow accurate tracking. 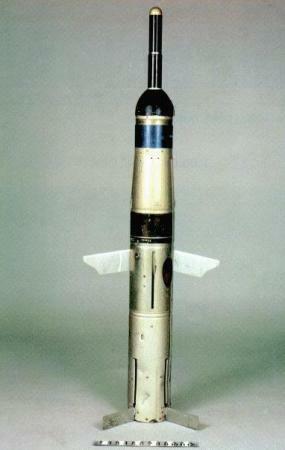 The BGM-71B, which replaced the BGM-71A on the production line in 1976, was a version with an extended range. It was essentially identical to the BGM-71A except for a longer (3750 m (4100 yds)) guidance wire. The BGM-71B was mainly developed for the airborne application, to allow for a greater stand-off range of the helicopters. The BTM-71B was the extended-range training round. In 1973, development of the Texas Instruments AN/TAS-4 thermal night sight for TOW began. This system, which became operational in January 1980, gave the TOW a viable night-attack capability. In 1978, the ITOW (Improved TOW) program was initiated to develop a TOW variant effective against new types of armour. The BGM-71C ITOW reached IOC (Initial Operational Capability) in April 1981. It had a new copper lined warhead of slightly larger diameter, and also an extendable nose probe fuze. The probe extended after missile launch, and ensured that the warhead detonated at a stand-off distance from the target for optimum efficiency of the shaped charge. The new warhead and fuze improve the armour penetrating capability to about 700 mm. The BTM-71C is the corresponding training round. The further improved BGM-71D TOW 2 was first delivered to U.S. Army and USMC units in 1983. It has a still larger and heavier warhead, which increases the diameter of the warhead section to that of the main missile body. It also has a slightly longer nose probe, an improved double-base rocket motor, and a new countermeasures resistant digital guidance system. Armour penetration capability is increased to about 800 mm. Although I haven't found any reference to it, there is probably also a BTM-71D training round for the TOW 2. In 1987, the production switched to the BGM-71E TOW 2A, which had been developed since 1984. The TOW 2A is designed to defeat tanks equipped with ERA (Explosive Reactive Armour) blocks. It has a small shaped-charge warhead in the nose probe, which explodes the ERA when it's hit, so that the main warhead remains effective against up to 1000 mm of conventional armour behind the ERA. The BGM-71E also adds ballast to the tail to counter the added weight in the nose probe, and has a timing device to detonate the small primary and large main warheads at the optimum interval. The BTM-71E is the TOW 2A training round. Together with earlier versions, the TOW 2A was extensively used in Operation Desert Storm, where more then 3000 TOW missiles (mostly BGM-71D/E) were fired. In September 1987, Hughes was awarded a development contract for the BGM-71F TOW 2B, which eventually entered service in 1992, after limited production had begun in 1990. The main new feature is the Overflight Top Attack (OTA) capability. The TOW 2B has a completely redesigned nose section, which includes two downward sequentially fired tantalum EFP (Explosive Formed Projectile) warheads, and an active dual-mode (optical laser/magnetic sensor) fuze. The laser and magnetic fuze work together to detect the height profile and the large metal mass of a tank, detonating the warheads exactly above the target. The guidance system is also updated, flying the missile at a preset height above the operator's line of sight, so that the latter can still point his cross-hairs directly at the target. The BGM-71F does not replace but supplement the BGM-71E. The designation BGM-71G was allocated to variant of the BGM-71F with a different armour-piercing warhead, but this version was apparently not produced. In 1996, Hughes offered to retrofit some existing TOWs with a new warhead against Bunkers, Light Armour And Masonry (BLAAM). Prototypes of the BLAAM warhead were tested, but no operational missiles were retrofitted. In 1989, Hughes demonstrated a variant of the TOW 2 with a wireless millimeter wave data link, but this version, sometimes referred to as TOW 2N, was not procured. Also in 1989, a new Kollsman AN/UAS-12C night vision sight entered production, as an improved alternative to the older AN/TAS-4. There have been various proposals to develop a fire-and-forget successor to the TOW. An IIR (Imaging Infrared) seeker was tested by Texas Instruments in the early 1990s, but not adapoted. The FOTT (Follow-On To TOW) program, begun in 1996 as a design competition for a TOW successor, was cancelled without a result in 1998. However, efforts to develop a fire-and-forget guidance method either as an upgrade for existing TOW rounds or for new missiles continued, and at that time it is hoped that such a system may be ready in the 2005/2007 time frame. Beginning in 2000, Raytheon was developing the TOW-FF (TOW Fire-and-Forget), which is a TOW with an IIR focal plane seeker, and a wireless data link for optional command guidance. However, funding limitations led to the cancellation of the TOW-FF program in 2002. The BGM-71H variant, also known as TOW Bunker Buster, is a BGM-71E TOW 2A modified with a new warhead specifically designed for penetration of thick masonry and reinforced concrete bunkers. Development of this version began in mid-2001, and it is currently in production. 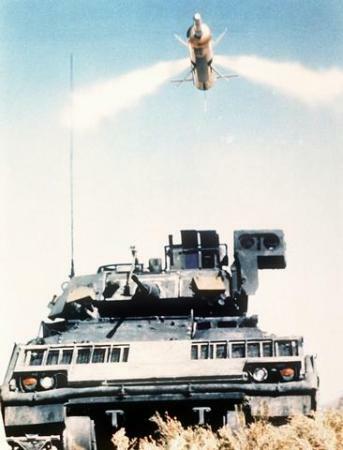 In 2001/02, Raytheon and the U.S. Army have tested the TOW 2B Aero (originally called TOW 2B (ER) (Extended Range)) variant of the TOW 2B, which is a relatively minor modification of existing rounds to extend the range to 4500 m (14800 ft). The missile has a longer guidance wire and a more aerodynamic nose for enhanced flight performance. The qualification tests of the TOW 2B Aero were conducted in 2003, and the first production contract was awarded in June 2004. No separate BGM-71 series designation for the TOW 2B Aero has been announced (it is possible that it is designated as BGM-71F-6). The TOW 2B Aero has been further developed into a wireless missile, which replaces the wire with an RF data link. The RF command transmitter is located in the expendable missile container, and therefore no modifications to the launcher itself are necessary. 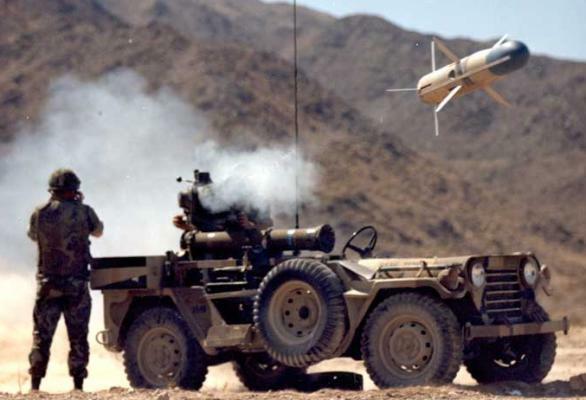 In October 2006, Raytheon received the first production contract from the U.S. Army for wireless TOW 2B Aero missiles. The most important current vehicles in the U.S. Armed Forces, which can be equipped with TOW launchers, include the M2/M3 BFV (Bradley Fighting Vehicle), the M901 ITV (Improved TOW Vehicle, based on the M113A1 chassis), and the USMC's LAV-AT (Light Armoured Vehicle - Anti-Tank). Additionally, TOW launchers can be mounted on lighter vehicles like the HMMWV. The main airborne platform is the M65 armament subsystem used with Army and Marine Corps AH-1 helicopters. Production of the TOW continues with the BGM-71E/F/H and TOW 2B Aero variants. Including production for non-U.S. customers, more than 620000 BGM-71 missiles of all versions had been built by 2001. Of this total, the U.S. Armed Forces (Army, Marines) procured about 190000 BGM-71A/B/C, 78000 BGM-71D, 51000 BGM-71E, and 40000 BGM-71F missiles.